Live at the Little Theatre Club. Garrick Yard. St. Martins Lane, London, in 1973-74. Read Putting myself in the frame of reference, culling old and fond memories by Bill Smith. Spring 1963: Britain was in another economic slump and Canada beckoned. The music left in my mind is Tubby Hayes, Joe Harriott, Phil Seamen, Don Rendell, Sunday lunchtimes at the pubs. Fall 1966: The time of jumbo jet contracts. American money draws me back to Britain. 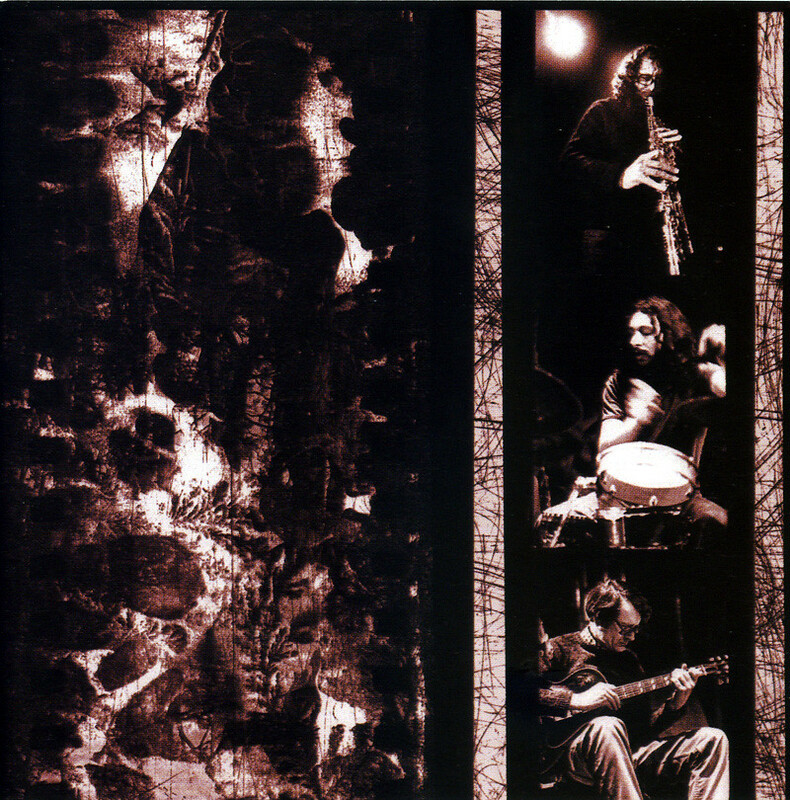 London has changed; the South Africans are in exile, and the new British movement of improvised music spearheaded by Trevor Watts, John Stevens and Paul Rutherford is beginning. The venue is The Little Theatre Club. Origins: If Joe Harriott was the father of the British avant garde, he was, with few exceptions, alone in his venture, and the real beginning of an original British improvised music must belong to Trevor Watts, John Stevens and Paul Rutherford. 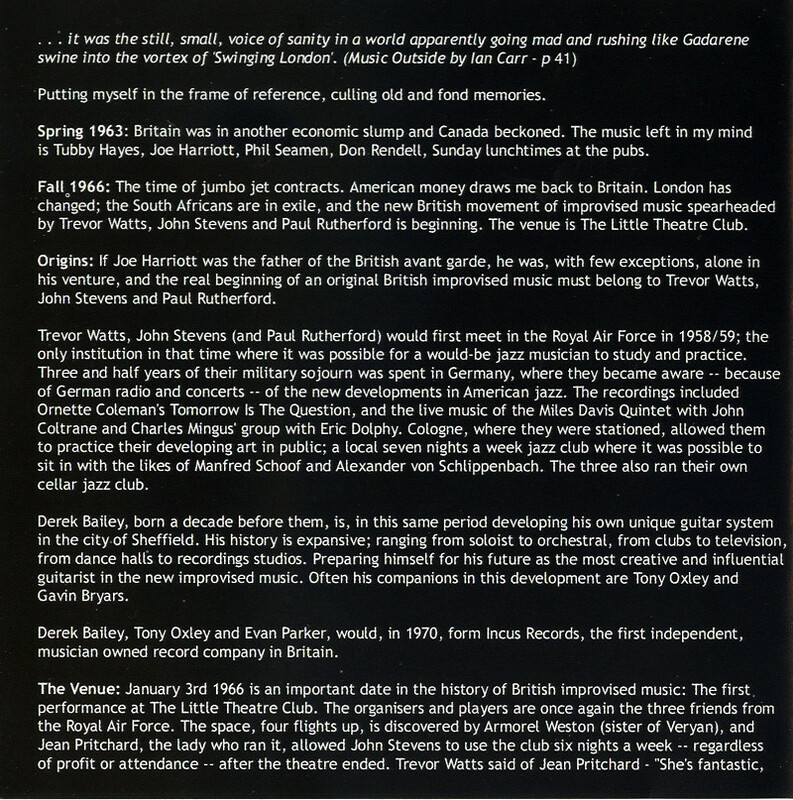 Trevor Watts, John Stevens (and Paul Rutherford) would first meet in the Royal Air Force in 1958/59; the only institution in that time where it was possible for a would-be jazz musician to study and practice. Three and half years of their military sojourn was spent in Germany, where they became aware — because of German radio and concerts — of the new developments in American jazz. The recordings included Ornette Colerman’s Tomorrow Is The Question, and the live music of the Miles Davis Quintet with John Coltrane and Charles Mingus’ group with Eric Dolphy. Cologne, where they were stationed, allowed them to practice their developing art in public; a local seven nights a week jazz club where it was possible to sit in with the likes of Manfred Schoof and Alexander von Schlippenbach. The three also ran their own cellar jazz club. Derek Bailey, born a decade before them, is, in this same period developing his own unique guitar system in the city of Sheffield. His history is expansive; ranging from soloist to orchestral, from clubs to television, from dance halls to recordings studios. Preparing himself for his future as the most creative and influential guitarist in the new improvised music. Often his companions in this development are Tony Oxley and Gavin Bryars. Derek Bailey, Tony Oxley and Evan Parker, would, in 1970, form Incus Records, the first independent, musician owned record company in Britain. The Venue: January 3rd 1966 is an important date in the history of British improvised music: The first performance at The Little Theatre Club. The organisers and players are once again the three friends from the Royal Air Force. The space, four flights up, is discovered by Armorel Weston (sister of Veryan), and Jean Pritchard, the lady who ran it, allowed John Stevens to use the club six nights a week — regardless of profit or attendance — after the theatre ended. Trevor Watts said of Jean Pritchard – “She’s fantastic, because it doesn’t draw all that many people and she let’s us use it!. . .She must be an angel or something!” A few months later Evan Parker came down from Birmingham, heard the band and immediately became involved, as also did Derek Bailey. Paul Rutherford discovered a bass player who was in a band playing Monk tunes, and that turned out to be Barry Guy. Others first involved were singers Julie Tippetts (nee Driscoll) and Maggie Nichols; John Stevens also encouraged Kenny Wheeler to become involved. Over the next ten or more years it became central to the burgeoning London scene, a place where the ideas and experiments of the new generation, known and unknown, could develop. The Music: The enclosed CD comes from three separate evenings that John Stevens had organised. 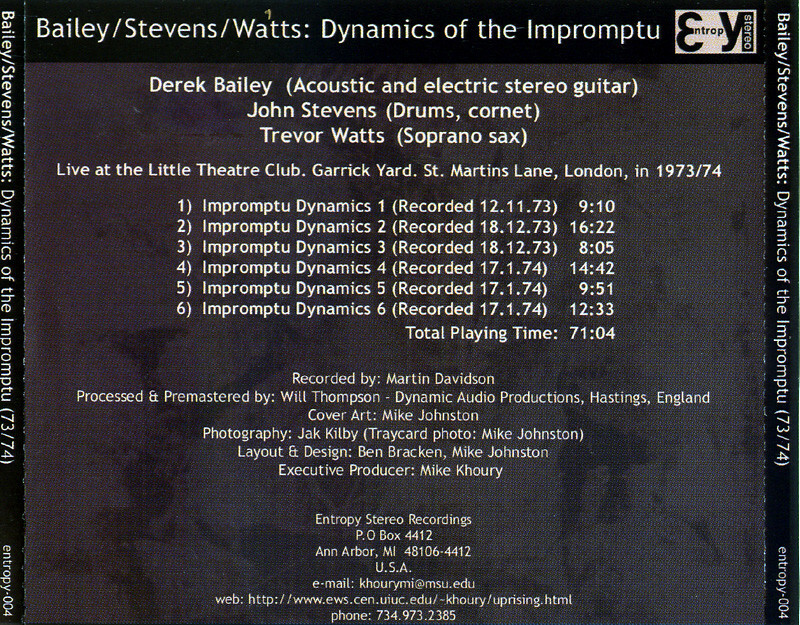 John and Trevor Watts were the Spontaneous Music Ensemble of this time, a duet that performed regularly, and Derek Bailey was playing solo. Martin Davidson, who often lugged his tape recorder to these gigs, there to record Derek Bailey, simply kept the machine going when the three played together at the end of the evening. Happenchance! 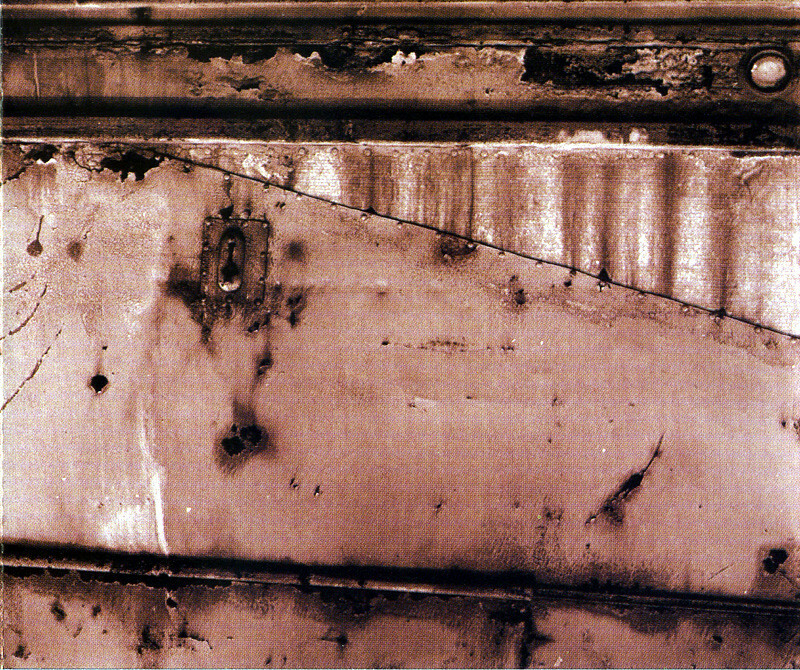 Of the music itself, anything I would say could only be an opinion, but if it is to be related to American jazz — this is the first release of Trevor Watts, and certainly this trio, on an American label — it can only be thought of as the other parts of the music; they are their own song/structure/rhythm, and listening I would have to think that the results are much more to do with their language, dialects (Yorkshire and London), of the literature oj Joyce and Beckett, or even the Goon Show, cricket and pints of warm beer, than influence from across the Atlantic. In fact it’s most unlikely that musicians from either side were even aware that the others existed when they set out on their adventures. A Personal Note: This is of course only one of the combinations that has evolved since that day in 1966, but it is now clear that indigenous British improvised music is a historical fact, that it has influenced musicians world-wide to become involved in its form. Had I not visited London for those six months in the fall of 1966, heard the music of the Spontaneous Music Ensemble, taken lessons from the South African saxophonist Ronnie Beer, it seems highly unlikely that I would have ever become an improvising saxophonist in Canada years later. 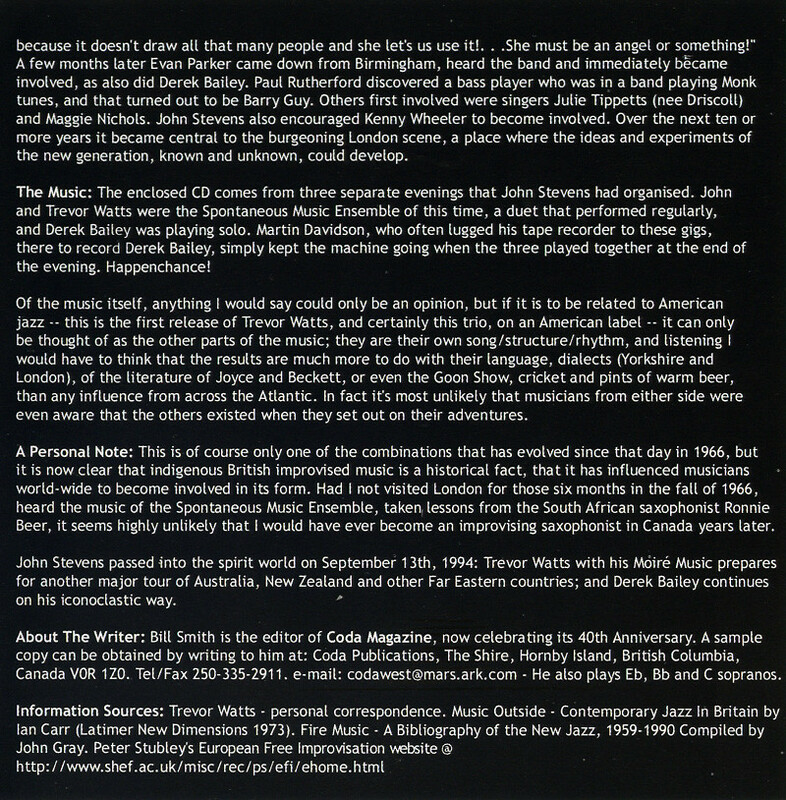 John Stevens passed into the spirit world on September 13th, 1994: Trevor Watts with his Moiré Music prepares for another major tour of Australia, New Zealand and other Far Eastern countries; and Derek Bailey continues on his iconoclastic way. About The Writer: Bill Smith is the editor of Coda Magazine, now celebrating its 40th Anniversary. A sample copy can be obtained by writing to him at: Coda Publications, The Shire, Hornby Islands, British Columbia, Canada VOR 1ZO. Tel/Fax 250-335-2911. e-mail: coda west@mws.ark.com – He also plays Eb, Bb and C sopranos. Imagine three scholars sitting under dim lights at a coffeehouse discussing world politics or social disorder? 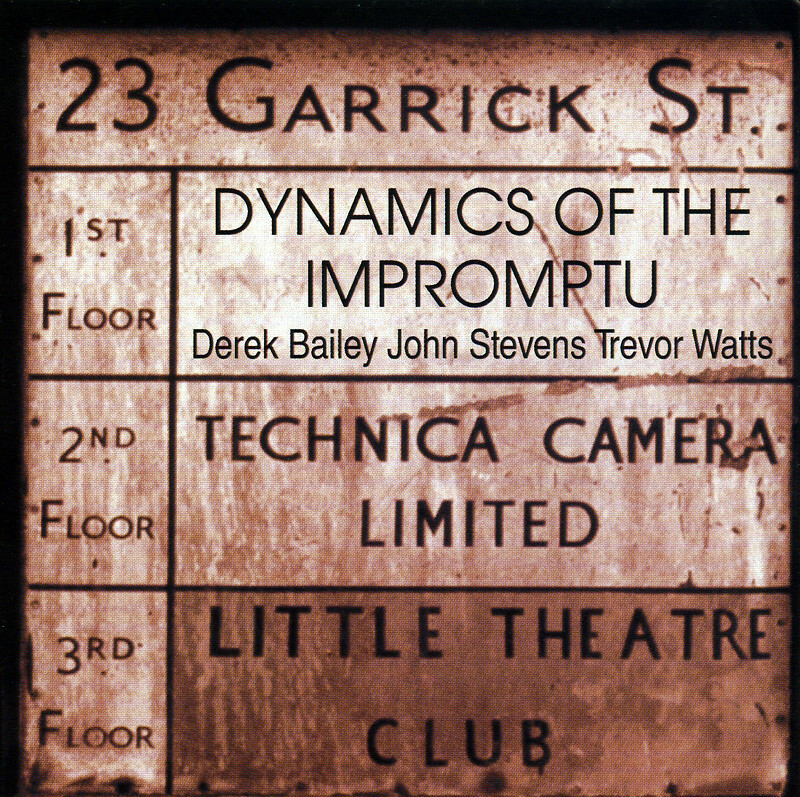 Dynamics of the Impromptu may imply such a scenario as three of the founding fathers of the British Free-Jazz movement coalesced at London’s “Little Theater Club” in 1973 and 1974. Dynamics of the Impromptu represents previously unreleased material which signifies a flourishing and historical time for this endearing and important era of free-improvised jazz. Bailey, Stevens and Watts perform 6 improvised pieces titled “Impromptu Dynamics 1-6”. Impromptu is an elegant word indicating spontaneity or in musical jargon —“improvised”. Here, the three masters immerse themselves in articulate dialogue through unconventional musical invention. Watts’ spurious and at times briefly stated activities on soprano sax intersect Bailey’s uncanny, totally unique chord structures, harmonics and ingenious thematic approach. The late John Stevens, well known for his cutting edge Spontaneous Music Ensemble is a true clinician here and proves beyond a doubt that he was one of the early innovators or stylists within the British Free movement. Stevens, subtle and intricate patterns keep pace through suggestion or rhythmic intimation, which contrasts textbook style meter and tempo. These pieces run the gamut from whispery low key musings through enraging or boisterous call and response. The moods constantly shift and evolve as Watts, Bailey and Stevens purvey musical structures that defy logic. Emotions flare up as in “Impromptu Dynamics #6”. Arguments or debates are imminent. The sensibilities of unity and collaboration resurface as the music seems to transcend conventional ideology or acceptable agendas.